"Is your life interesting? Are you happy?" It's easy to be yourself, but it's hard to be yourself on purpose. The artificiality that comes from acting is very much the subject of Quitting, a strange, ambitious but rather hollow recent film from China, which tells the story of Jia Hongsheng, a modestly successful Chinese film actor whose life was derailed by a brutal heroin addiction. Hongsheng is the only trained actor in the film—he plays himself, and his story is told with the actual participants. Those are his parents playing his parents, his sister playing his sister, his doctors playing themselves, and so forth. It's a strange reconstruction of reality, and makes for some wooden performances by these non-professionals. It would be easier to go along for the ride if the story was told with a greater amount of craft, but unfortunately that isn't the case. There's an even bigger problem with Quitting, which is that its hero comes off as a spoiled, indulged little monster. (I do feel sort of bad criticizing someone's life in this way, and don't mean to make light of a heroin addiction; but hey, you make yourself the star of a major motion picture, and you ask for it.) Hongsheng seems to be an actor of no great talent or renown, and he treats everyone around him horribly. It's kind of hard to believe that he's in his mid- to late twenties here, because his behavior is much more consistent with someone ten years younger: moodily storming out of the house, hitting up Dad for beer money, just generally being a surly adolescent. We expect that from someone who's in high school; for someone who's a decade past that, you may want to shake him and shout, "Learn a trade, son." She stands next to me. Telling me which way to go. You'd think that the Lennon posters plastered all over Hongsheng's bedroom walls would be a tipoff to the translator, but no such luck. Hongsheng is also a guy who looks at Taxi Driver as a training film, which, aside from being deeply misguided, is also weirdly out of time. Surely by 1993 bootleg copies of Reservoir Dogs, at least, had made it to China—Hongsheng could use a little more Mr. Black, and a lot less Travis Bickle. Periodically the director, Zhang Yang, dollies back to show us that it's all on a set, or has an on-camera interview with someone in Hongsheng's life; but that Brechtian device can't mask the fact that he doesn't have much to work with. Hongsheng ends up in a mental hospital, in scenes that seem like tired rehashes of stuff from The Lost Weekend and One Flew Over the Cuckoo's Nest. It's a modestly intellectually engaging movie, but its lack of emotional involvement in its characters' inner lives renders it close to inert. Image Transfer Review: Color levels are nice, but there seems to be a whole lot of debris present, detracting from the overall visual quality. It seems as if little or nothing was done with a battered release print when transferring the film to DVD, which is unfortunate. Audio Transfer Review: Good use is made of the 5.1 capability, especially in the hospital scenes, and in general, the audio quality is much higher and cleaner than the video. Extras Review: An original trailer, along with trailers for two other Chinese films, are the only extras. 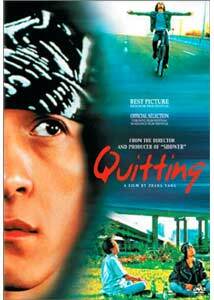 Quitting has some stylistic ambition, but little else to recommend it. It's a rough road when your protagonist is unsympathetic and is surrounded, on purpose, by non-actors, and it's a challenge that the movie doesn't really meet.